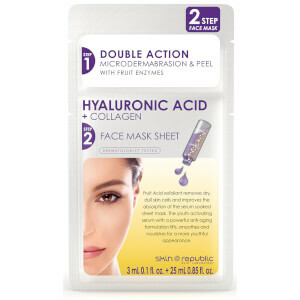 Resurface your complexion with Skin Republic 2 Step Hyaluronic Acid + Collagen, a dual-part facial treatment with anti-ageing benefits. The first step of the treatment comprises an exfoliating skin peel that uses natural Fruit Enzymes to lift away dry, dead skin cells and improve absorption of the second step. The nourishing sheet mask is infused with a serum containing Hyaluronic Acid and Collagen, which replenish moisture to the complexion and promote a plumper, firmer skin texture. After the two-step treatment, skin will appear brighter, smoother and enviably youthful. Cleanse skin. 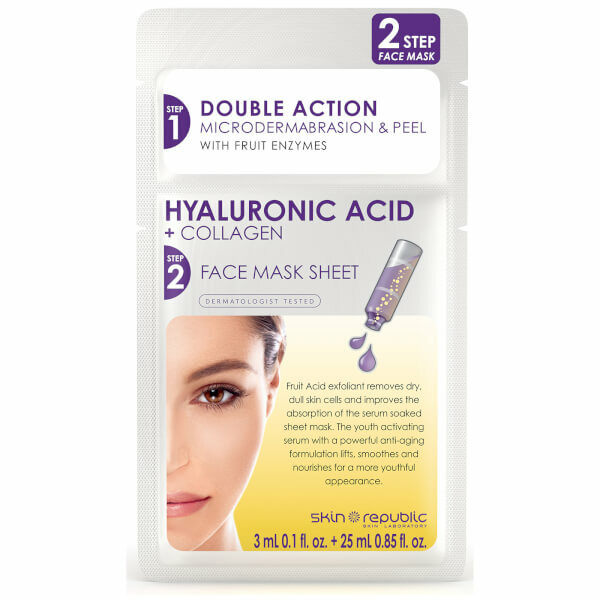 Tear open Step 1 sachet and apply peel to face, massaging gently for one minute, then rinse off. Tear open Step 2 sachet, remove mask from packaging, unfold and place onto face. Wear for 15-20 minutes. Remove mask. Do not rinse off – excess serum can be applied to neck and décolletage. Scrub: Aqua, Cellulose, Glycerin, Dipropylene Glycol, Alcohol Denat., Betaine, Hamamelis Virginiana (Witch Hazel) Water, Camellia Sinensis Leaf Extract, PEG-60 Hydrogenated Castor Oil, Carbomer, Triethanolamine, Portulaca Oleracea Extract, Anthemis Nobilis Flower Water, Aloe Barbadensis Leaf Extract, Prunus Armeniaca (Apricot) Seed Powder, Phenoxyethanol, Chlorphenesin, Caprylyl Glycol, Ethylhexylglycerin, Tocopheryl Acetate, Actinidia Chinensis (Kiwi) Fruit Water, Citrus Aurantium Dulcis (Orange) Fruit Extract, Lavandula Angustifolia (Lavender) Flower Water, Benzophenone-5, Pyrus Malus (Apple) Fruit Extract, CI 17200, CI 19140, Parfum. Mask: Aqua, Glycerin, Propylene Glycol, Panthenol, Sodium Hyaluronate, Caprylic/Capric Triglyceride, Hydrogenated Lecithin, Ubiquinone, Tocopheryl Acetate, Glycine Max (Soybean) Seed Extract, Retinyl Palmitate, Hydroxyethylcellulose, Carbomer, Triethanolamine, Polysorbate 80, Hydrolyzed Collagen, Adenosine, Disodium EDTA, Methylparaben, Parfum.